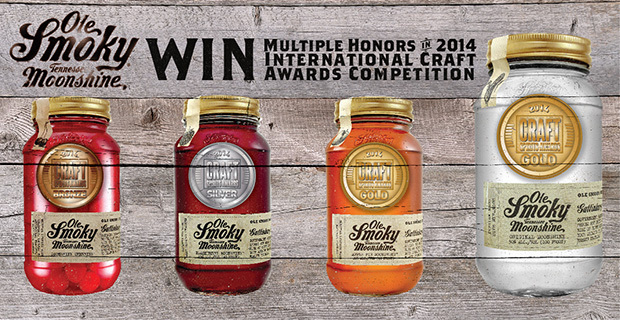 Gatlinburg, TN (May 23, 2014) – In the wake of earning a coveted Impact Hot Brand Award just last month, Ole Smoky® Tennessee Moonshine has garnered four medals during the 2014 Craft Spirits Awards International Competition. The independently owned distillery based in Gatlinburg, Tennessee received the following distinctions: Ole Smoky Original Moonshine™ and Ole Smoky Apple Pie Moonshine™ won gold, while Ole Smoky Blackberry Moonshine™ won silver and Ole Smoky Moonshine Cherries™ earned a bronze medal. Judging for the Craft Spirits Awards International Competition took place in Los Angeles on May 6-8, with medal winners announced thereafter. In “blind” taste tests before a panel of nearly two dozen spirits experts, numbered flights were evaluated on a 100-point basis, with points given in areas including visual (appearance), aroma (nose), taste (flavor), finish (balance) and overall. Hosting the judging was Forrest Cokely, an expert in the field of spirits, mixology and a seasoned judge at various spirits events worldwide. Ole Smoky is the leading distiller of premium moonshine in the U.S. and the first federally licensed distillery in the history of East Tennessee. The company’s roots can be traced to the early settlers of the Great Smoky Mountains, where they refined the art of whiskey making in order to survive during tough economic times. When Tennessee state law changed in 2009, allowing the licensed production of whiskey and other spirits across new counties, a group of local families saw an opportunity to showcase the art of superior, mountain-made moonshine.